Chicago is a vibrant, exciting city loaded with amazing sights, shopping, activities, and entertainment. It offers world-class museums, beautiful parks, delicious food, colorful ethnic neighborhoods and popular favorites like Navy Pier, Willis Tower, Millennium Park and Shedd Aquarium. The sample itinerary for this 4-day Chicago tour lets you experience them all! No Windy City adventure would be complete without a stop by historic Navy Pier, Chicago's lakefront playground and the Midwest's premier leisure destination, featuring 50 acres of parks, promenades, gardens, shops, eateries and attractions. Take a spin on a 15-story tall Ferris wheel and catch a flick at the IMAX® Theatre. Run amuck on three floors of interactive fun at Chicago Children's Museum, hop aboard a cruise or speed boat departing from Navy Pier's South Dock and browse Family Pavilion’s exciting retail shops for that perfect Chi-Town souvenir. Summertime on the Pier brings spectacular twice-weekly fireworks shows perfectly synchronized to music on Lake Michigan; Navy Pier has it all, in a classic carnival atmosphere! One of the most popular attractions at Navy Pier, Seadog has thrilled over 1,000,000 guests. Whether you're a history buff, love architecture or just wanna have fun, Seadog offers a cruise for everyone! Choose from a variety of awesome tours including an open water Extreme Thrill Ride, a 30-minute Lakefront Speedboat Tour and a 75-minute Architectural Tour. Weekends in October, the Chicago Haunts Tour ferries passengers through Chicago's darker history; costumed guides regale you with spine tingling tales of supernatural occurrences, moonlit mysteries, and infamous figures as you cruise along the beautiful Chicago River. Conservation-minded Shedd Aquarium is a true Windy City treasure and the world’s largest indoor aquarium, to boot! Its Caribbean Coral Reef entertains spectators with divers feeding nurse sharks, barracudas, hawksbill sea turtles and others; in the Oceanarium, you’ll see a crew of skilled trainers run enthusiastic dolphins through their repertoire of leaping dives, tail walking and other slick tricks! The Wild Reef-Sharks at Shedd experience brings you way too close and personal to sharks and other predators as you bravely observe them through a floor to ceiling window. This phenomenal 24-5 acre public space situated atop a parking garage on the world-renowned Loop District is Chicago's definitive modern showplace – a favorite destination and gathering spot for Chicagoans and visitors, alike. 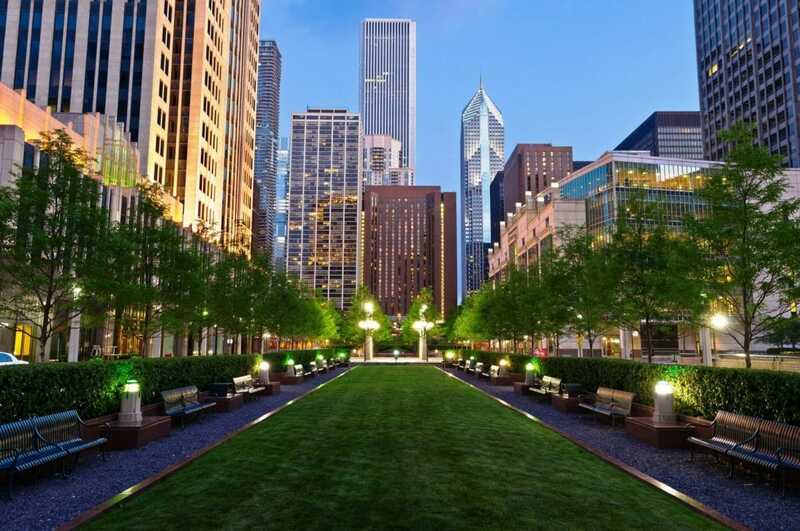 Stunning architecture, breathtaking landscape design, fantastic concerts and more share the spotlight in this park in the heart of the Windy City. Its standout features Jay Pritzker Pavilion, Cloudgate (a huge reflective sculpture nicnamed “The Bean”), beautiful Lurie Garden and ultra-cool Crown fountain are absolute must-sees on any Chicago agenda. The view from the top is better than ever, thanks to TILT at 360 Chicago, the city’s newest thrill attraction, conveniently located along the Magnificent Mile in the former Hancock Observatory. 360’s 1,000-foot perch regularly treats guests to sweeping views of Lake Michigan, four neighboring states, and the Windy City’s dazzling downtown. Those wanting a new twist on the spectacular panorama can “TILT” outward an unnerving 30 degrees from the building for a vertigo-tripping free-faller’s view of the street way below. Out-of-this-world shopping, fabulous dining and top-notch accommodations abound on the Magnificent Mile, and plenty of historic sites - including the Chicago Pumping Station and a water tower that survived the Great Chicago Fire - pepper this prestigious stretch of Chicago’s Michigan Avenue, world-renowned for its diversity of upscale attractions. Wonderful seasonal events draw the crowds, while many of the world's leading retailers - favorites like Bloomingdale's, Neiman Marcus, Saks Fifth Avenue, Nordstrom, and Barneys New York – keep them shopping. You'll find all your favorite luxury boutiques and designers right here - heavy hitters and industry standards , alike - while three “urban shopping centers” tender habitual browsers, mall mavens and confirmed hobby shoppers all the traditional mall trappings along with plenty of attractions and entertainment, Magnificent Mile-style. Water Tower Place is Chicago's premier shopping destination, situated along Michigan Avenue at the pinnacle of the Magnificent Mile, and features a stunning eight-level atrium housing more than 100 popular stores and restaurants along with a scattering of distinctive specialty shops and boutiques. Its zippy elevators whoosh you from one floor to the next in the blink of an eye, facilitating a unique, high-energy “vertical” urban shopping experience – the kind you won’t find elsewhere in the Windy City. Water Tower Place is, in short, “THE” perfect place to satisfy die-hard mall mavens in need of a spree as well as confirmed power shoppers with a mission to accomplish! What better way to top off a fast and furious day exploring all things Chicago than to treat your bunch to a Blue Man Group “celebration!” Blue Man Group merges music, technology and comedy to create a hybrid form of entertainment that defies categorization and appeals to people of all ages. Their shows have been described by critics as “innovative,” “energetic” and “wildly entertaining”; the only real way to “get” Blue Man Group’s global popularity is to see the show for yourself. Take your seat wearing “play clothes”, be prepared for the unexpected, and expect an evening of non-stop movement like nothing you’ve ever imagined! You’re going to leave smiling, we promise - maybe with a marshmallow or two stuck in your hair. The Windy City is home to many wonderful museums; so many, in fact, we don’t expect you to try and see them all. What we will do is throw a few ideas out there, so you and your Grad Group can decide which will make it onto your fabulous 4-Day Chicago Itinerary! Here are the Top Ten: The Museum of Science and Industry; Museum of Contemporary Art; The Art Institute of Chicago; The National Museum of Mexican Art; Adler Planetarium; The Chicago History Museum; The DuSable Museum of African American History; The Field Museum of Natural History; the Notebaert Nature Museum and Shedd Aquarium. Ready...set...pick! They’re all winners. No way you’re gonna leave Chi-town without paying proper respects to some of the notorious faces and places that built the city’s tough-guy reputation. Be sure to get your name in the books for the original Gangster Tour, conducted aboard the big, black, custom-built, climate controlled and cushy Untouchable Tours' Gangster Bus. Experience the dark, dangerous Chicago of the 1920s and 30s; see actual hit spots and check out gangsters’ old hot spots and haunts. Enjoy historically accurate accounts by cheeky informative guides of the exploits and final exits of Al Capone and the resta da boys on the ultimate 1 hour, 45-minute live action tour that gets you and your pals the inside scoop on Chicago's windiest politicians, its rollicking red-light districts and most notorious vice games!